Nearly half of all owner-occupied homes in the UK have three bedrooms which seems ideal for the most common family size of two adults and two children. However, the third bedroom in many properties is often only a box room, and with more and more adults working from home – either full time, or on a flexible basis a few days a week – many people want to use this as a home office. The solution for many homeowners is to convert their loft to provide an extra bedroom, and possibly a second bathroom or shower room as well. And while loft conversions are rarely cheap, they are often very good value compared with the stamp duty, conveyancing fees and removal costs involved in moving house just to gain more living space. Once you’ve decided that converting your loft is the right option for you, follow these steps to help ensure that your investment provides what you need – and delights you for years to come! Start by deciding what you want to use the space for. Is it to be another bedroom, a guest room, a playroom, or a home office? Do you want to include a bathroom? In this design, a gable is added to the side wall of your house which changes the shape of your roof. 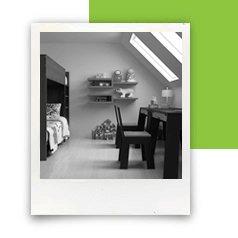 This adds a considerable volume of space to your loft. Hip to gable loft extensions are obviously not an option for mid-terrace houses, but they’re a popular choice for detached, semi-detached and end-terrace homes. They will usually also include a dormer or Velux window. Quite how much space can be added is clear in the photo below of two semi-detached properties in which the right-hand home still has its original roof shape, but the home on the left has had a typical hip-to-gable loft conversion with Velux windows to the front and a rear dormer. A dormer extends your roof space by protruding from the existing plane of the roof. Most dormers include a window. Dormer windows with pitched roofs often add real architectural interest to a property but to do this, they are often quite small in size and so from a practical point of view their main value is in providing light rather than space. Larger dormers that span almost the full width of your property, and are generally only permitted at the rear of your house, are an effective way of adding space with adequate headroom, and generally don’t need planning permission. Dormers can either be built in situ or pre-fabricated and fitted in place with a crane. In contrast with dormer extensions which simply protrude from the existing roof, Mansard loft conversions restructure the roof. They also usually require planning permission. Constructing one involves extending the party wall upwards and then building a box-like, flat-roofed structure from this. This design tends to maximise the amount of space you can get from your extra storey, and many people consider them more aesthetically pleasing than the ‘stuck on’ look of large dormers. Although other manufacturers of roof windows that sit in the plane of your roof do exist – and can be cheaper – almost all architects and builders refer to this type of window as a Velux window and use that brand. Velux windows allow light to flood into your loft – so much so that you will probably want to select integral blinds to go with them – and generally don’t require planning permission even if they are fitted to the front of your roof. Need home insurance during building works? Images of beautiful homes and loft conversions that you can find online or in magazines often fail to take into account that real life requires quite a lot of storage – for clothes, books, toys, Christmas decorations, ski gear, suitcases, pet carriers and all the other ‘stuff’ that we tend to accumulate! There are two aspects to this. The first is that you need enough storage space for the things that you should have in your new loft room. For example, if it’s a bedroom, you do need somewhere to put your clothes, and conventional wardrobes may well not fit against sloping roofs. Second, although it’s worth decluttering when you clear your loft in preparation for the builders to take over, you do still need somewhere to keep certain items which you use only irregularly. A great solution to both of these needs is to have eaves cupboards built in. This maximises the usage of space and makes sure that you don’t have to sacrifice storage in order to get more living space. When it comes to designing a loft conversion, you need to work with an architectural designer or architect to draw up plans, and then with a builder who has experience in working on this type of project. Start by asking people in your area who have had loft conversions on similar properties to yours for recommendations. Another way to find loft conversion designers is to look at planning applications for loft conversions on your local council’s Building Control website. These will usually show you the name of who drew up the plans. Specialist loft conversion companies often provide both design and build contractors: an advantage of this approach is that they are responsible for integrating communication between the two. Make sure you let your home insurance provider know about your loft extension project before the builders start work. Your home is subject to a range of extra risks when you have renovation work going on: HomeProtect can provide cover for this – find out about our renovation insurance here. What’s the difference between a ceiling joist and a floor joist? Joists are horizontal beams, usually made of wood in residential houses. In general, floor joists are thicker and may be placed closer together than ceiling joists. The joists used between the ground and first floors of standard-construction homes in the UK are floor joists because they support the first floor. Most joists between the first floor and the loft are ceiling joists, and although these are strong enough to support someone’s weight when they are putting empty suitcases or Christmas decorations up in the loft, they need to be reinforced or replaced with proper floor joists to strengthen the floor if a loft is converted for day-to-day living. Dormer windows are structures containing a window which protrude from the plane of the roof, and are usually a key part of loft conversion design. You may not need planning permission for a loft conversion if it doesn’t add more than a certain amount of additional volume to your existing roof space, there’s no change to the plane of the existing roof that faces onto the road (Velux windows fit with this, but dormer windows don’t), and various other conditions are met. What’s the minimum ceiling height needed in a loft conversion? There is no minimum ceiling height for loft conversions, although in practical terms you should plan for 2m of headroom. Areas in the eaves with less than this can be used for storage, whether in the form of built-in cupboards or free-standing furniture. However, Building Regulations do require at least 1.9m of headroom above the centre of a flight of stairs, although this is reduced to 1.8m at the edge. A recent report by Nationwide Building Society suggested that a loft conversion providing an extra double bedroom and bathroom could add up to 20% to the value of a three-bed, one-bathroom home. Got the builders in and need home insurance?